Should you add solar batteries when buying home solar panels? In Q1 2018 alone, the U.S. added more solar power than any other type of electricity and at year-end, solar accounted for 55% of all new electricity generation added. It seems this momentum has continued into 2019 with more homeowners than ever requesting solar quotes. How to compare solar energy storage solutions. As always, Solar-Estimate.org has you covered...lets compare the leading home energy storage solutions on an apples for apples basis, look at whether solar batteries are economic for your home and explore what types of solar batteries are out there. How do you compare solar batteries? 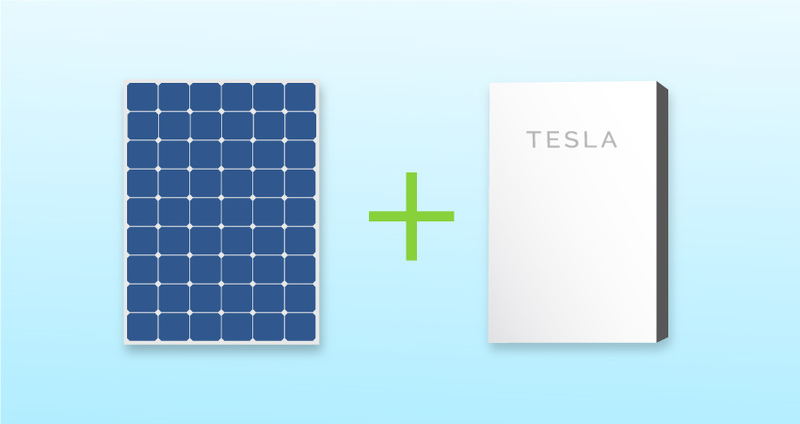 Despite competition from LG Chem ESS (Energy Storage Systems) products, the Sonnen ecoLinx, and also the recent increase in the price of the Powerwall, the Tesla Powerwall remains the best home solar energy storage option. The LG RESU home battery storage system is more expensive for less storage and so is the Sonnen product. Other products are coming along but solving the engineering challenges such that the battery management system works well with the grid-connect solar inverter is quite tricky and so home energy storage systems are the type of product where I would be reluctant to trust many other brands. What new solar batteries and home solar energy storage solutions might disrupt the market? Having given the above advice I actually have a system at home that uses BYD lithium-ion batteries and a Victron solar battery charger and battery inverter. They communicate with two Fronius Symo grid connect solar inverters that run the solar panels. So far the system is working pretty well but there is an issue sometimes when the Victron battery inverter tells the Fronius inverter to frequency shift to lower solar power output rather than do what it should, export all excess solar power to the grid. No one seems to know why. Each BMS (battery management system) and each solar inverter need to talk to each other well for these home solar energy storage systems to work and this is why I am reluctant to recommend emerging brands. I do still love my battery storage system though and Victron and Fronius seem to have most of the bugs ironed out. Tesla realized in late 2018 that its market-leading Tesla Powerwall battery was by far the cheapest solar battery solution, per kWh of storage capacity, and so increased the price. It should be noted that these prices do not include installation. I have long been critical of the amount Tesla was telling customers they should allow for installation because the amount (previously $800–$2000) was not high enough that skilled solar companies would want to touch the product. The current installation allowance guide is $2,000 to $3,000 but given the product has a 10-year warranty (and it is likely that if a Powerwall fails then poor installation may be blamed) I think it is still unlikely that the better solar companies would want to do this work and take on a 10-year obligation to answer customer calls about the product for this amount of money. The jury is still very much out as to whether the battery chemistry of the lithium-Ion batteries in the Powerwall will last the 10-year warranty period anyway and so I can understand installation companies wanting to stay well clear of this potential minefield. How solar batteries solve the inherent intermittency problem of solar power? The biggest challenge to solar energy is not electrical power generation itself; it’s the fact the sun isn’t always shining and power generation from solar panels does not generally match your home’s power consumption pattern. Solar energy storage is the only way to fix this timing mismatch. Are solar batteries worth it if you have access to net metering? Net metering laws allow us to “store the economic value” of the excess solar that we generate during the day and use these credits to pay for power used at night, effectively allowing us to ignore the timing mismatch between generation and consumption and that solar panels don’t generate electricity at night. If you live in one of the states where utilities are still offering 10 or 15-year net metering contracts (CA, MA, FL, CT, MD, NY, NJ, CO, SC, NC, OR and some parts of Texas) or similar retail-based pricing for excess solar exported to the utility grid (AZ, UT, and NV) then you should definitely be buying solar panels for your home in 2019 while you have the benefit of net metering and the 30% federal solar tax credit. In this case, I wouldn’t be worrying about solar batteries yet; I would just be buying a regular grid-tied solar system. The 30% solar tax credit reduces at the end of 2019. If you have not already done so you can estimate the cost of solar panels for your home on our site. If you are lucky enough to live in one of these states your biggest issue may be finding a solar company who can install your solar panels before 31 December 2019 when the solar tax credit falls. Does time-of-use electricity billing create a new reason to buy solar batteries? The prevailing logic until 2019 is that solar batteries aren’t worth adding to home solar systems in states where net metering laws exist. Why buy a physical product that costs money and only lasts 10 years (if you’re lucky) when lawmakers make your utility offer you a one-for-one credit for excess solar electricity you generate during the day? It costs you nothing to use this credit at night. However, this logic is changing in states where residential customers are being forced onto time-of-use electricity plans that have cheaper electricity prices during the morning and early afternoon and more expensive periods in the late afternoon and early evening. Why is there new interest in solar energy storage batteries in 2019? Many states are now considering mandating time-of-use electricity charging and California has already done so. With this change taking effect in 2019 there is sure to be an increase in interest in solar energy storage solutions. Does a home solar system need to have a battery? Off-grid solar power system – Solar panels, a solar battery charger, and a battery inverter that turns DC power stored in the battery into useable AC power. What types of solar batteries are available? Until recently, the majority of solar-powered homes with energy storage used lead-acid batteries. These were either flooded lead-acid batteries or AGM batteries. These offered quite a long cycle life and were sometimes also called deep cycle batteries, which is strange given that most lead-acid off-grid solar batteries were set up to only discharge to a depth of discharge of 50%. This is because to discharge the battery deeper would reduce the cycle life of the battery. Today, home energy storage systems using various types of lithium-ion batteries are becoming most popular. There are a number of different types of lithium-ion batteries including lithium iron phosphate batteries (LiFePO4) and lithium cobalt batteries. The popularity of lithium-ion batteries comes from their higher energy density (more kilowatt hours of storage in a smaller space) and the fact that they can discharge their power down to 10% remaining (a depth of discharge of 90%). Some would argue this is a fad and lithium-ion don’t have the proven track record of 30 or more years that lead-acid batteries have. How many cycles do you get from solar batteries? With lead-acid batteries, 2,000 to 3,000 cycles was considered good. Lithium-ion batteries have between 1,000–4,000 cycles although the Tesla Powerwall gives a warranty based on time rather than cycles. It offers a 10-year warranty with 80% of original capacity but we will all have to wait and see if the battery chemistry of the lithium-ion batteries within the Powerwall really do last that long.